You must be a member of the Madrid Talk Italian Group to attend this activity. Would you like to join this group? Come segue questo mese di gennaio??? I’ve a new, amazing Italian activity for our group!! 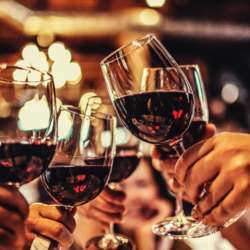 I’m very glad to invite you to an ITALIAN WINE AFTERWORK, a cool activity where you can enjoy an Italian afterwork dinner (apericena) for a very affordable price! This time, our italian style activity will be in a new, cozy and chic place, where you can chat with friends while you are eating and drinking delicious Italian food! We will have Italian food with the Italian “aperitivo” formula, with a buffet that include different Italian food and one drink (the place have many different types of wine, but you can drink spritz and other Italian cocktails too, or Italian cola, cedrata spuma, bitter etc. etc.!!!) During this activity it will be possible to meet new friends and to speak Italian and other language in a relaxing atmosphere. This new venue is a Italian wine bar and during the activity you can enjoy different types of wine, and buy a bottle of wine too! The place owner, Fabio, is an Italian expert about wines and he can suggest you what kind of wine to drink! INSTRUCTIONS: You have to arrive to "Metro Bilbao". When you arrive at restaurant, you have to look for me (EMILIA). You have to pay to waiter 12 euros, that include ITALIAN BUFFET and a drink (can be an Aperol Spritz or Italian cocktail, or a wine/beer/softdrink). This venue is a small place, so please put your attendance at the event if you are sure to assist! Ti aspettiamo per una gradevole serata in compagnia e per spizzicare del cibo delizioso!